Ruben Mosqueda of Oregon Music News spoke with Saxon’s drummer Nigel Glockler. Portions of the interview appear below. OMN: It’s been awhile since Saxon played a proper U.S. tour. Glockler: We did about two weeks on the Call to Arms tour but you’re right. it’s been a while. We’ll be doing a month this time around. It’s great that we’ll get to play places like Portland this time around because we haven’t played there in years! OMN: Saxon has to play all the hits but you’re also not afraid to mix it up with some new stuff. How hard is it to draft a set list for you? Glockler: It’s a nightmare! (laughs) The more albums you release the more choices that you’ve got. We’re on tour obviously to promote the new album so we’ve got to play five to six new tracks and then everything else just has to fit around it you know? (laughs). OMN: Obviously people who are metal fans are familiar with Saxon’s back catalog which includes classic records like Saxon, Denim & Leather and Wheels of Steel. You’ve been on a roll starting with 2004’s Lionheart and you returned for the follow-up album Inner Sanctum. Worldwide Saxon has kept the same level of popularity, but Stateside there’s been this renewed interest in Saxon. Glockler: Yeah, I mean we can play in front of 70,000 people in Europe; obviously they all haven’t come out to see us, but we are headlining one of the stages and they are there watching us. I think the [renewed] interest has a bit to do with stronger material and a push by the label to be quite honest. I think there’s been a resurgence in traditional heavy rock–people have heard the ‘thrash and death’ or whatever you call it and they want the traditional stuff. We’re getting some really young kids at our festival appearances and they know all the words to the songs. OMN: There’s an interesting parallel between Saxon and a band like Motorhead who haven’t been this huge, ‘blockbuster’ band like a Def Leppard or a Bon Jovi. Saxon and Motorhead have always been able to capture the youth. Glockler: Yeah, basically their audience grows with them, doesn’t it? We’re attracting the kids all the time. We’re proud that we’ve able to achieve that–not a lot of bands from our area can say that. OMN: You joined Saxon in 1981 and were in the band until about 1987. What led to your first departure from the band? Glockler::Yeah, I’ve left a couple of times haven’t I!? (laughs) The first time I got fed up with management quite frankly. I got to the point that I hated what I was doing and I just wanted out. Then I got the gig drumming for GTR with Steve Howe I needed a break–I needed a change. That was it pure and simple. Then I came back 1989 and left in 1997 after Unleash the Beast tour. In the middle of that tour we went to South America we didn’t take our gear so I used a rental kit. I ripped a muscle between my arm and my shoulder. I kept playing and finished the rest of the tour. When I was playing it was fine but when I went to the hotel or the tour bus to lay down to sleep my back and my neck were in excruciating pain. I was like “My God what is going on? !” Eventually after the end of the tour I went to see my doctor and I was told that I had ripped a muscle and that I needed to stop playing for five to six months. That’s what happened. I’m all healed up now but I was away from the band for a while. I was still writing with them; I was doing everything, just not recording or touring with them. The break from drumming and touring made me fall in love with the drums again. OMN: What’s your favorite thing about touring the United States? Glockler: I love it over there. My wife is American. In fact my first wife was American as well. (laughs) I guess I have a thing for America I guess?! (laughs) I love it over there. People are great, they’re so polite, the fans are great and the music is incredible. I’ll tell you what I’m looking forward to in Portland, I was talking to my friend Dave McClain (Machine Head) and he was telling me that I really need to try Voodoo Doughnuts! (laughs). Read more at Oregon Music News. Saxon is currently on tour with Fozzy. 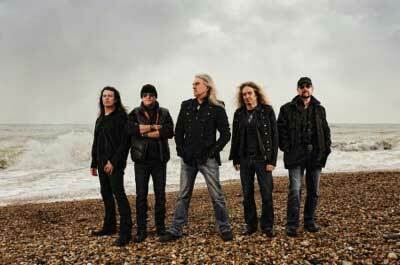 Saxon remains true to their metal sound for over 30 years. Cannot wait until the unplugged album is released. ……………. Crusader!!!!!!! !